ArraySink wraps a fixed size buffer. The buffer is full once Put returns non-0. 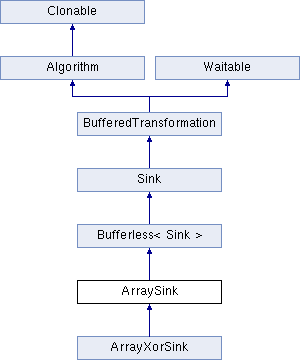 When used in a pipleline, ArraySink silently discards input if the buffer is full. AvailableSize() can be used to determine how much space remains in the buffer. TotalPutLength() can be used to determine how many bytes were processed. Definition at line 1136 of file filters.h. Definition at line 1144 of file filters.h. Definition at line 1150 of file filters.h. Definition at line 1155 of file filters.h. Definition at line 1159 of file filters.h. Definition at line 557 of file filters.cpp. Definition at line 551 of file filters.cpp. Definition at line 535 of file filters.cpp.